Are you into salads? Then there is one place in New York you cannot miss; Sweet Green. 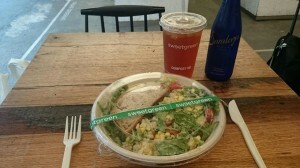 They have 3 branches in NY; one at Broadway, one in Greenwich and one salad bar in Nolita. to experience simple, pure and authentic flavors at all Sweet Green restaurants. All salads are prepared while you watch it with a fantastic range of whole vegetables, fruits and grains. For a list of the latest seasonal salad menu, go here.